Pandans, or the containers of betel (pan), were important and treasured objects in India and other parts of South Asia for centuries. The chewing of betel is a very old habit, associated with leisure and a refined lifestyle, with particular social functions that were greatly important at court and with the upper classes: “During royal audience (darbar), the ruler would “calmly” chew betel, perhaps to show his detached, and therefore superior, judgement. 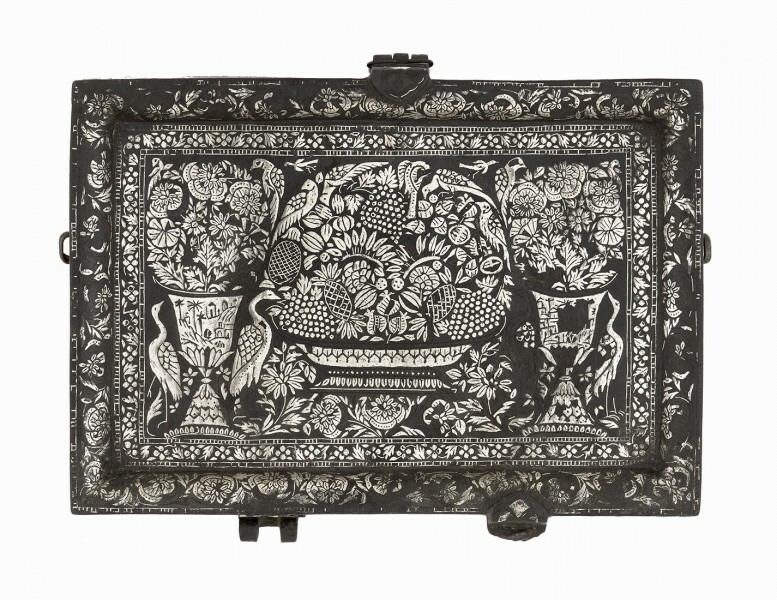 The offering of the royal pan to a courier was a sign of extraordinary favour, and an even greater honour would be the offering of the betel container (pandan). On a less august level, betel was offered to guests in aristocratic and middle-class homes, usually after a meal and just before their departure.” (Zebrowski, 263). The present 18th century figural Bidri pandan has a rectangular shape, and its inside is divided into different compartments to suit its function of containing the different ingredients of the betel. The pandan is ornamented with poppies on all four sides, while the lid is covered by an exuberant cornucopia where a large and full fruit bowl and two adjacent flower pots are inhabited by several birds. The same element of a poppy is repeated along the sides of the pandan, with a decorative floral band below. The elegance of this typical floral decoration, however, is used to frame and embellish the great inventiveness shown on the fantastic lid. The drawing shown there is of great variety, with the delineation of fruits such as pineapples and grapes, as well as different kinds of flowers, birds, and decorative objects. Some elements are drawn with a finer line, while others are shown as volumes where the silver inlays are allowed to shine more strongly. The attention to detail is great, perhaps nowhere greater than in the inclusion of figurative scenes decorating the flowerpots on each side of the replete fruit bowl. The present pandan combines a particular Deccani expression and energy in the almost excessive quality of the banquet scene, with a more Mughalised kind of representation that leans towards a greater naturalism. The cornucopia that decorates it might have also originated in a European model of a still life. Spink & Son, London, 1970s.